Home » Mobile » Android » If Android is so popular, why are many apps still released for iOS first? Comments Off on If Android is so popular, why are many apps still released for iOS first? ated every day, it’s nearing 1bn activated in total so far, and that by the end of this year that total will include more than 70m Android tablets. Big. Yet a lot of apps still come out for Apple’s iOS first or even exclusively. Right now, if you own an iOS device, you can play Plants vs. Zombies 2, Clash of Clans and Worms 3, but Android owners can’t. Instagram launched on Android 18 months after iOS. Nike’s Nike+ FuelBand still hasn’t made the leap. Mailbox and Tweetbot are still no-shows, and while much-praised children’s app-maker Toca Boca has 18 apps available on iOS, only one of them is also on Android Mexicom. This week, yet another research firm, Canalys, fuelled the flames of this debate by pointing out that 30% of the 50 top paid and 50 top free iPad apps aren’t also available on Android – although 11 of the 30 un-ported apps were made by Apple, so their Android-less status is hardly a surprise. So what’s going on? If you’re one of the millions of new Android users wondering why you can’t get some apps your Apple-owning friends can, here are some reasons, analysis of whether they’re fair, and some optimistic thoughts on why this may change. Is this fair? Fragmentation, as it’s called, may not be solved, but it’s become a more-manageable problem – and thus a less-convincing excuse for avoiding Android altogether. Improved development tools are making porting easier, and there’s more data (including Google’s own) to help developers decide which Android devices to focus their energies on first. If they’re upfront with users about which phones and tablets their app will work on, the support queries’ aspect becomes less daunting too. What? When developers are slow to support Android, it’s often not just about the money and time they’ll spend getting there – it’s concern about the money they’ll make once on the platform. Yet a.) piracy is also a fact of life on iOS through some elements of its jailbreaking community, b.) it’s always difficult to work out how many pirates represent genuinely-lost sales – would they have bought the app otherwise? – and c.) if an app is free (or freemium) then piracy is much less of a headache. On the Android-users-less-keen-to-pay point, it’s true that iOS is still more lucrative for developers. Apple has paid out more than $10bn to its developers, while Google hasn’t given comparable figures. Analytics company Distimo estimated that in April 2013, if you added the revenues from iOS‘ App Store and Android’s Google Play together, their respective shares would be 73% and 27%. But a year before, that had been more like 81% and 19%. It’s improving, in other words, and as it does, more apps come out for iOS and Android simultaneously, or at least take less long to jump from the former to the latter. Why don’t some developers support Android? Because they’re lickspittle Cupertino-loving blinkered Apple fanboys, as are the journalists who write about their apps, and anyone else who praises iOS and/or criticises Android. Or so the theory goes. No, seriously, some iOS developers focus on that platform alone because they like Apple and/or aren’t that keen on Android. But for others it’s more a resources issue – small studios and startups picking one platform when they’re just starting out (see: Instagram). And there is an element, I suspect, of some app developers wanting to stay in Apple’s good books by supporting its devices first or exclusively: hoping for promotion in the App Store, a fleeting appearance in Apple’s ads, and maybe even a slot on-stage at one of its press launches. It’s no secret that Apple likes developers who use (appropriately, obviously) the whizzy features of its devices, and the new elements of its annual software update for iOS. Choosing to prioritise iOS over Android is sometimes part of this desire to keep in the company’s good books too. Owning an Android device in 2013 is less bleak on the apps front than, say, in 2009. The problems outlined above have all been improving – or at least becoming less of an issue – over time. 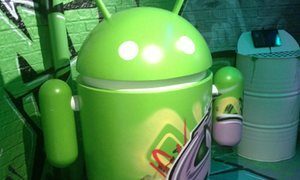 Meanwhile, the sheer scale of Android is making it worth many more developers’ while to get their apps onto Google-powered devices as quickly as possible. That improvement can be seen in the Canalys study. Stripping out the Apple apps, 19 of the 100 most popular iPad apps aren’t on Android. A year ago, that figure would have been much higher. “Developers are starting to move from creating new products on the basis ‘iPhone, then maybe Android’ to ‘iPhone and then Android’ or even ‘iPhone and Android at the same time’. Cool little apps from seed-funded companies are still iPhone-only, but most big well-funded businesses are doing both. So yes, if you own an Android device, you still get some apps late or not at all. But it happens less than it used to, there’s a huge pipe of interesting stuff being released – see this blog’s 50 best Android apps from 2013 so far article, or the weekly roundup of 20 new Android apps for evidence there.